Making my own activewear has been an exciting new adventure for me this year, and today I’m so excited to share with you my favorite set yet! 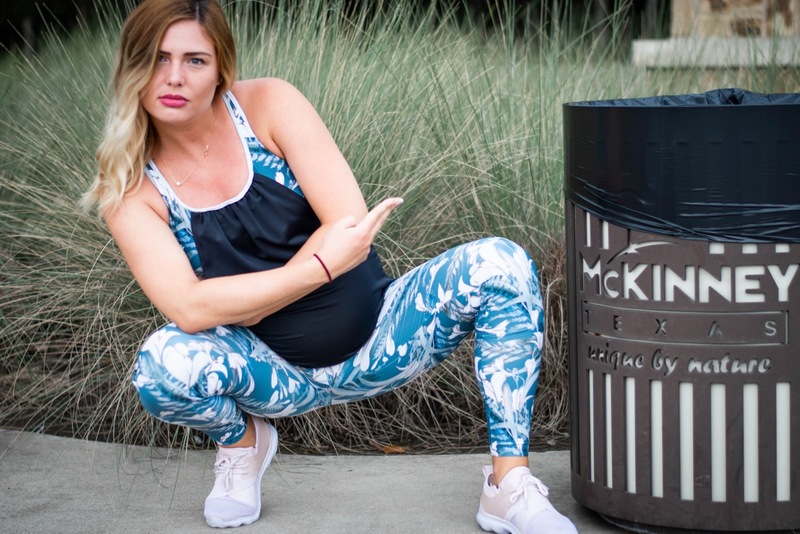 I have never been one to splurge on my activewear – though I admired cute, luxury activewear from afar, I have always been content to head to the gym in my running shorts and old graphic tanks. As long as I could move in my clothing, I felt good enough about it! However, I wasn’t extremely fond of many of the pieces in my “gym clothes” drawer, and decided why not try my hand at something that was a little more my style? Feeling great about my clothing has never made a situation worse, so I set out on a bit of an activewear adventure. After sewing up my first tank and leggings combo this spring, I was hooked. So needless to say that when Pine Crest Fabrics reached out to me about a collaboration opportunity, I was OVER. THE. MOON. with excitement! They supply some pretty amazing companies, such as Speedo, PVH, and Walt Disney, so I couldn’t wait to have the chance to work with such high quality fabrics. I was given the opportunity to work with their Olympus Knit Fabric, which is an incredible blend of 75% polyester, 25% spandex. The fabric is perfect and wide at 57”+, and has a great weight, at about 250gsm. The stretch is great due to the awesome spandex ratio, and the weight makes it perfect for leggings or tops, as seen here! They have a great range of solid colors and prints, and I had free reign to pick my favorite option. It was a hard choice, but I couldn’t pass up this beautiful blue / grey floral print. This is by far the most luxurious athleisure clothing I’ve sewn up so far. Because I knew that this fabric was going to hit it out of the ballpark, I really wanted to sew up something that I would feel cute and stylish in. You’ve probably seen that I’ve been gushing in my Instagram stories about the Peg Legs lately, so I already knew which pattern I’d be using for my leggings. I went with the under belly maternity V-band here, and they are so much fun. You can hardly see the V under my big belly when I wear them, but trust me, it’s such a beautiful finish. I couldn’t stand the thought of these leggings not being a great option after pregnancy, so the under-belly waist was the obvious answer here – hopefully, these are just as cute (if not CUTER) after baby girl arrives! I’ve been raving about my new gigantic cutting mat, and it was perfect for cutting out these leggings – I didn’t have to slide my perfectly aligned fabric around at all to ensure the full piece was on the mat! I’ve linked it below in my key ingredients section, along with (of course), my handy dandy heat n’ bond. I won’t be caught making leggings without either of these ingredients ever again!! close-up detail of the awesome waist band! For the top, I went with the Agility Overlay tank. I made a “wearable muslin” of the sports bra version of this pattern a few weeks back, using some fabric leftover from a previous activewear project! You guys know that I am not much for muslins, but I knew that I wouldn’t want to risk wasting a single bit of this gorgeous fabric when it came down to it. Once I felt comfortable with the pattern, and had identified the tweaks I’d want to make with the “real thing,” I moved on to this version. This pattern offers SO many options – two separate back views, sports bra or bra with tank overlay, low cut sides or higher cut sides, multiple finishing options for the waistband of the tank, as well as maternity and nursing modifications. I chose the lower cut sides on my tank overlay (to best showcase the gorgeous print, used here for the bra! ), the strappy back view, and the simple tank overlay with no modifications or bands. I opted out of the maternity tank modification, because I felt that the normal tank measurements offered enough room for my belly, and again, I wanted this to be something that I will continue to wear well after pregnancy! In order to maximize the wearability of this outfit, I chose to use the feature fabric for the leggings and sports bra, and a solid Olympus for the tank overlay. 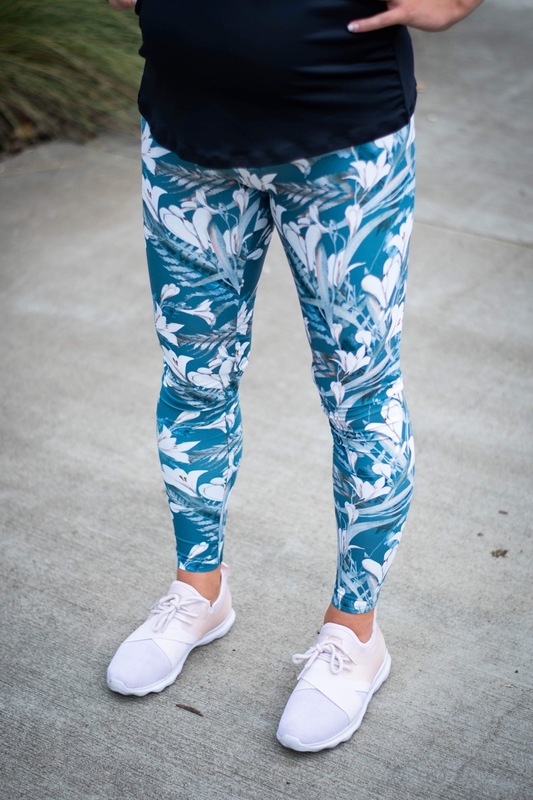 I think this gives me an outfit that looks workout chic and so put together, but also gives me the flexibility to wear either of these pieces with a more subtle separate – for instance, my dark grey Sloan leggings or a white graphic tank. I personally made two changes to the pattern – the first was to create my binding and straps out of foldover elastic, rather than fabric binding. I felt that this created a sleeker look, and from what I understand from other sewists, eliminated the most fiddly part of the pattern construction! The second change I made was to create a folded up casing for my elastic in the bottom of the bra portion, rather than to sew the edge of the elastic to the edge of the fabric, then turn up and hem. I followed the pattern instructions for my test version of the bra, and I just didn’t love the finish – I felt like an enclosed elastic casing would be sleeker looking, so that is what I went with here, and I’m glad I did. I love the finishes throughout this garment!! Here are a couple of things I really love about this fabric. This is the most compression-like fabric that I have sewn workout gear in. I feel nice and tight and held in when I wear this set (or as separates! ), and that is a pretty big deal when you’re 6 weeks from your due date and feeling a little larger than life!! There is a GREAT 4-way stretch in this fabric, but thanks to the tight hold of the fabric, I can move, sit, run, or do yoga and the print does not thin out, stretch, or become see-through. This is HUGE – again, between my hips and my belly bump, things are just bigger than normal lately and nothing highlights that better than an awkwardly stretched out fabric print! Take a look – none of that happening here! The fabric is also incredibly soft – I find myself just rubbing my hands on it while wearing these pieces. Weird? Maybe. But you’ll do it, too, if you get some of this stuff so don’t judge just yet!! Two other awesome qualities that I did not know I needed in my life – this fabric is quick drying and has great moisture management. Whether you’re running outside in the sweaty Texas heat, carrying around a 34-week baby bump, or running into a fast food chain in the middle of an absolute monsoon (which I did about 45 minutes after these photos were taken!! ), you’re not going to have to put up with wet clothing. True story – I honestly looked like I had hopped out of a shower fully clothed after running the short distance from the car to dinner in the evening after these photos, but within 10 minutes, I was dry and warm as if it had never happened. The other super cool feature? Sun protection. I did not know, and could not tell you how sun protection is built into fabrics, but it can be, and this incredible Olympus Knit has a UPF rating of 50+. Seriously, how cool is that? Though we’re working our way into fall (ever so slowly) here in Texas, this is going to be SUCH a great feature for running around in the blazing hot Texas summer next year!! I’m a little fearful that I may be spoiled to these luxe workout fabrics for the rest of time. But truthfully, I’m not even mad about it. After years of working out in my not very stylish shorts and tanks, I’m excited to rock some glamorous me-made gym wear from here on out. There are so many more gorgeous Olympus prints available out there, my only problem is going to be picking out which one I’ll choose next. Take a look at the link below and let me know your favorites in the comments!! Fabric: Olympus Knit – Pine Crest Fabrics – you can find all of their readily available retail options here!! 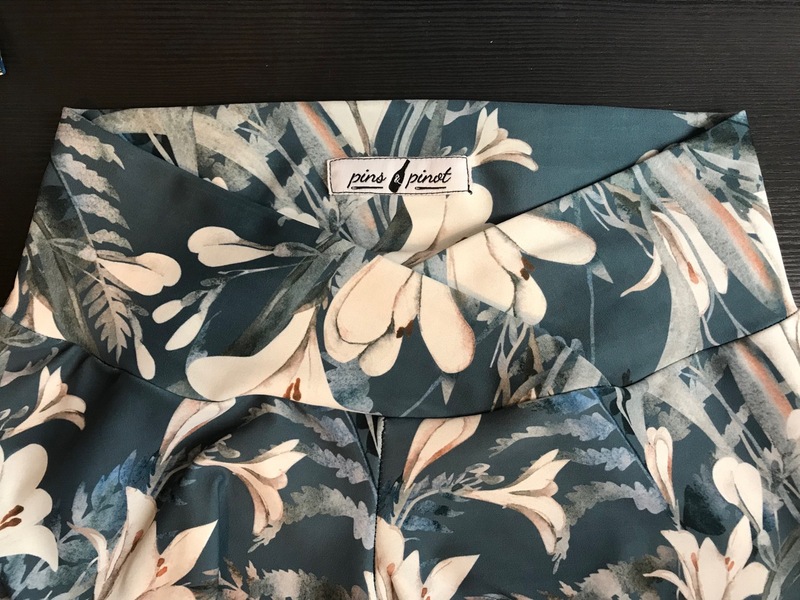 Though the fabric used in this post was generously provided to me by the awesome people over at Pine Crest Fabrics, all opinions expressed are my own, as always! … annnnd a blooper for good measure. Next Post Mama Baby Hospital Set!